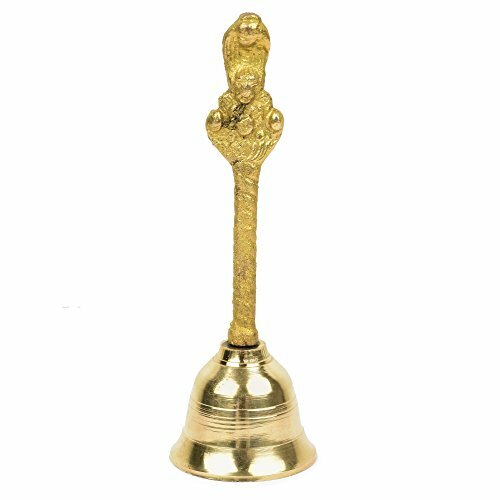 A ghanti is an Indian bell used in Hindu rituals. The same term is also used to describe Buddhist bells. The bell is generally made out of brass. A clapper is attached to the inside and the bell makes a high-pitched sound when rung. The top of the bell handle is usually adorned with a brass figure. Because the ghanti is believed to chase away asuras and summon the Devas (Gods), it is used in a lot of Hindu rituals such as puja. Measures 6.5 inch in Height & 2.5 inch in Diameter, weighs 230 gram.